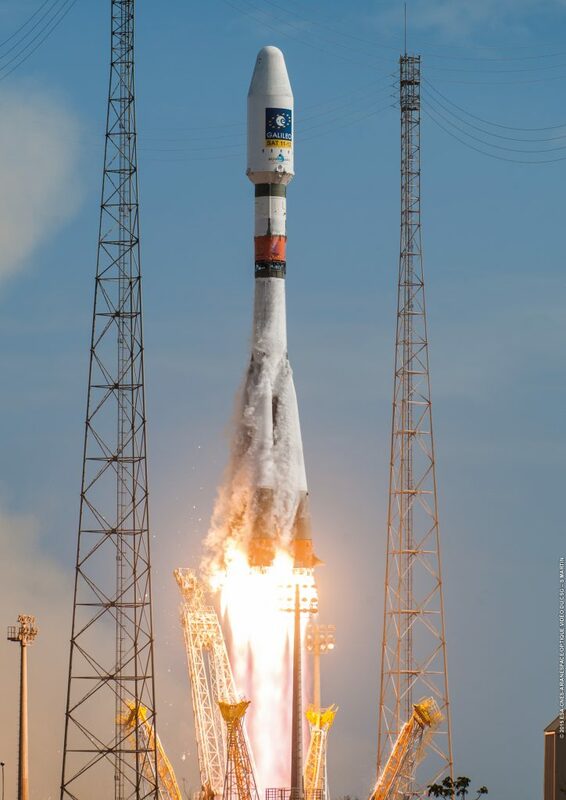 The Soyuz 2-1B rocket carrying Galileo FM-8 and FM-9 blasted off from the Guiana Space Center at 11:51:56 UTC and quickly raced into relatively clear skies over the tropical launch site, marking the 12th launch under the auspices of Arianespace in 2015. 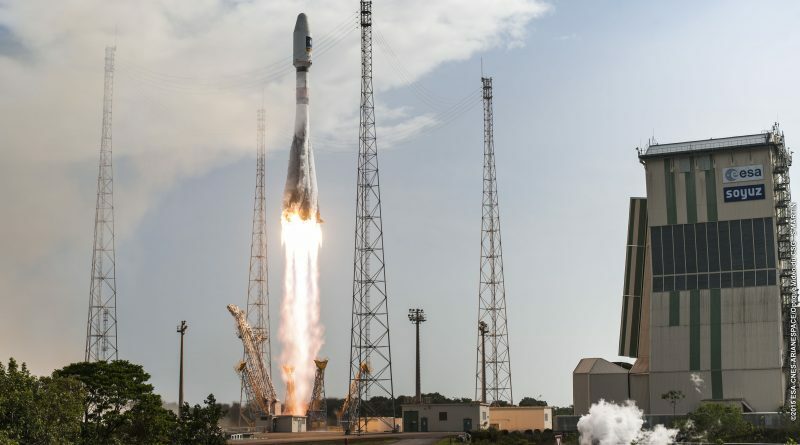 It was the third Soyuz flight from French Guiana this year, all three being dedicated to the continued deployment of the Galileo satellite constellation. Thundering off to the north east, Soyuz fired its four boosters for nearly two minutes to give the vehicle the required kick to embark to its target orbit. Heading on under the power of the core stage alone, the Soyuz shed its payload fairing ahead of the hot-staging sequence in which the large core stage made way for the modified Block I stage and its RD-0124 closed cycle engine. Nine and a half minutes into the flight, the Soyuz released the Fregat MT upper stage for a two-burn mission lasting over three and a half hours. The initial boost of the Fregat, coming shortly after separation from the Soyuz, was over 13 minutes in duration and put the stack into an elliptical transfer orbit ahead of a coast phase of three hours and 15 minutes to set up for the critical circularization maneuver. Fregat re-started its engine for four and a half minutes at the apogee of its orbit to raise the perigee. Galileo FM-8 and FM-9, nicknamed Andriane and Liene, were sent on their way three hours and 48 minutes after launch. The two satellites targeted a circular insertion orbit at 23,522 Kilometers in altitude, inclined 54.94° which represents the graveyard orbit for the Galileo constellation, 300 Kilometers higher than the operational orbit. New satellites are inserted into the graveyard orbit to ensure they are functioning properly before descending into their operational slots – this way, satellites that fail at or shortly after insertion can not become a danger to other operational Galileo satellites. After orbital insertion, the two satellites entered a stable three-axis orientation, started communicating with ground stations and deployed their power-generating solar arrays. Radio tracking confirmed that both satellites had entered the expected orbit. 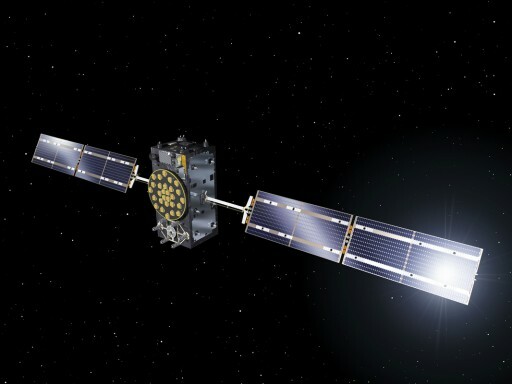 Galileo FM-8 and FM-9 will enter Slots 2 and 7 in Place C of the Galileo Constellation to establish a setup in which the system can begin delivering initial, limited services in 2016. Managed by the European Commission, Galileo is being built at Europe’s civilian counterpart to the military-operated Global Positioning System of the United States, the Russian Glonass and the Chinese Beidou systems. To consist of a total of 30 satellites orbiting in three planes, Galileo is set to continue deployment over the next several years using the Soyuz rocket to launch two satellites at a time and Ariane 5 carrying a group of four satellites per launch.